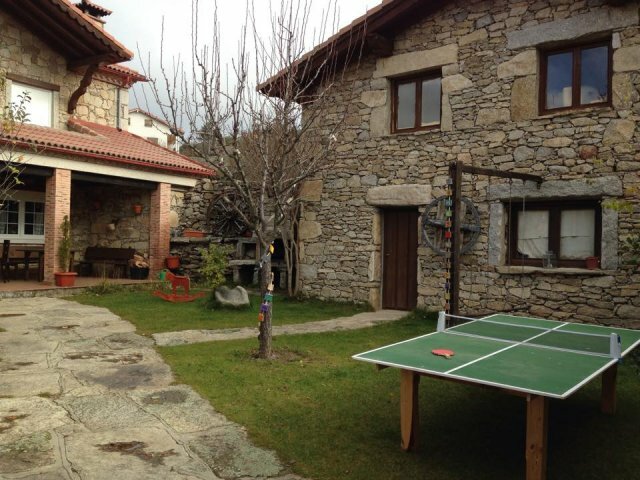 Travel to Navarredonda De Gredos and stay in this wonderful house in the southwest area of ​​the province of Avila. Here you will find yourself surrounded by the purest nature y you will be able to rest with all the comforts. Esta house is divided into 2 floors and has all kinds of amenities for you to enjoy the best of the holidays with your family because it has up to 8 people. A full kitchen , which are the wooden cabinets que keep utensils, and complemented by the appliances. In addition, there is a functional wooden table for you to eat right there. A nice muy living room, which features a lounge area with upholstered armchairs , que facing la fireplace, and from which you can watch TV . Just behind, a wooden table with chairs, next to the cupboard. a double bedroom, where there un integrated que bathroom consists of a hot tub como element principal. 3 double bedrooms, of which the first one is a suite in which there is room for a sitting area , the dressing , and integrated with whirlpool bath . The 2 rooms that remain have a pair of beds individual, and are very bright. It should be noted that in each of these spaces, there is television. A full bathroom with everything you need. Un porch with tables and chairs , from which to watch the kids when playing on the swings . Un quite large garden en the barbecue . Come to this municipality, the fifth highest in Spain , and enjoy a few days in this town of less than 500 inhabitants where you will find the tranquility you are looking for. Walk through the town and visit the Parador de Gredos - inaugurated in 1928 by King Alfonso XIII- or the I Church of Our Lady of the Assumption . It is of late Gothic style and as a curiosity, its bell tower is totally independent of the main nave. From the house, which is in the town, you walk to the main square where you will find the City Hall (5 minutes walk) along with several areas of bars and restaurants. What should you ask? Very easy, from starters some Iberian sausage and boar , which has great fame in the area. Of first course there are several options like migas pastoral or some potatoes machaconas with torreznos , but if you want something lighter a soup castellana. And if you're still hungry you can order a trout, caught in nearby rivers, or if you're more than a little kid , called as " the Gredos beef ". Alfredo Apausa Vegas My priority is that clients find themselves better than at home. Enjoy Gredos and remember your stay in the accommodation as the best. The views from the terrace, the comfort of the house the sunny porch with garden and enjoy a barbecue day or night, the swings, tranquility and silence.